After a warm and dry summer we did get ourselves enough moist for an entire extra water week. Prudent preventive measures abound and every good citizen will bring his or her own. 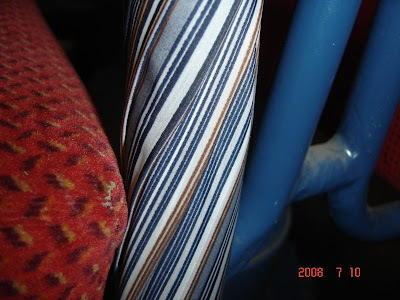 Here's a serious umbrella caught in standby mode on the Lidingö tram. I like this umbrella. Interesting design. I don't think I've seen an umbrella like it before. I hope the owner didn't forget it and leave it behind. The umbrella is safe at my work, Paz! LOL! Good. It's a fine-looking umbrella. I want one like that. For the better part of this summer, I guess Peter hardly needed it at all. Things have changed during the most recent week and quite abruptly too. One can only assume that the keeper of this no-nonsense umbrella has had plenty of opportunities to use it lately. The recent floods have proven a worthy opponent of any state-of-the art umbrella. So, where indeed did he get it? I found this umbrella in a trash can outside work in the late nineteen eighties. It was broken but I fixed it with three nails. Ever since then it has been my office umbrella. Really? Wow! An umbrella rich in history. Cool!